Home / Articles / 2012 / How Well Do You Know Your Starch? How Well Do You Know Your Starch? Riding a roller-coaster of a health reputation, the vital macroingredient is enjoying positive acclaim via sources such as pulses and alternative grains. Consumers hold conflicting thoughts regarding starchy foods. They value whole grains for their fiber and for the nutrients lost during the refining process, but evade the fact that it's the starch in the grain that provides what the consumer craves. Starch that can't be digested – so-called "resistant starch" – is gaining traction as a functional ingredient. Its attraction is that it functions like soluble fiber and can be added to a variety of foods to enhance their texture and reduce the rate at which sugar from digestion enters the blood. But the starch we can digest gets little credit, usually under the term complex carbohydrates. The fact is this much maligned macronutrient is the primary source of energy for humans. Starch is the energy-yielding carbohydrate of grains, beans, and potatoes. It consists of chains of glucose molecules linked together by specific bonds that can be broken by our digestive enzymes in a Pac-man-like disassembly process. "Complex carbohydrate" simply means chains of sugar molecules linked together like strings of peals, each pearl representing a sugar. Complex carbohydrates also can be indigestible fibers, polymers of glucose or other sugars linked by bonds our starch-digesting enzymes cannot break. These fibers reach the colon intact, and many are food for friendly bacteria. Digestible starch yields energy (4 kcals/g), regardless of its food of origin. Structurally, starches can exist in two basic forms: amylose, a relatively straight chain of glucose molecules, and amylopectin, the highly branched chain. Since starch-digesting enzymes work from only the non-reducing end of the molecule, amylose, which provides fewer ends, tends to be digested more slowly, releasing sugar to the blood stream slowly. Amylose yields more resistant starch, starch that reaches the colon undigested to function as a soluble fiber. This characteristic is desirable in some instances, but not always. For example, athletes need some of their carbohydrates available more quickly. Sources that have more amylopectin provide this need. Plants produce starches with characteristic mixtures of amylose and amylopectin. Because starch can bind water and gelatinize, it's a popular food component that can impart texture, mouthfeel and especially satiety to a variety of foods from entrees, soups and stews to snacks and desserts. Wheat starch has dominated the market for decades, a fact that has restricted the diets of consumers who have the rare but very serious condition known as celiac disease, a severe reaction to the protein gluten found mostly in wheat, rye and in some cases barley. The popularity of gluten-free diets has spread beyond its original audience, spurred on by celebrity endorsements and questionable claims of the detriment of gluten to those without celiac disease. Nonetheless, consumers continually seek alternatives to popular foods that are wheat-starch-based. The leguminous starch sources beans, peas and lentils (pulses) have enjoyed a recent jump in reputation for their health-promoting nature. Decades of research strongly support the positive effects of pulses on obesity and a variety of other risk factors for disease. While their high levels of gluten-free protein and antioxidants have burnished their reputation of late, it's well established that pulses contain significant levels of soluble fiber that have proven health benefits. 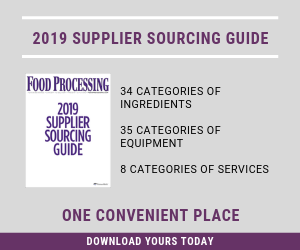 The use of pulses as functional ingredients in the food processing industry is a topic close to Pulse Canada, Winnipeg, Manitoba. The industry association represents growers, processors and traders of pulse crops in Canada. Ground into flour and fractionated into fiber, protein and starch, pulses are incorporated into a variety of foods, anything from bakery products and pastas to breakfast cereals, chips and snack bars. They can even be extruded to create meat analogues, taking advantage of the ability of components to form bind water and fat. In addition to wheat-extracted starches, Roquette America derives starches from corn, potatoes and more recently peas. Pea starch is extracted from the pisum sativum dry pea and is characterized by a large part of amylose and a low gel temperature, which explains its functional texturizing and film-forming properties. It's particularly good at gelling or thickening. Emsland Group and its distribution partner in the U.S., American Key Food Products Inc., Closter, N.J., develop potato- and pea-derived starches into a wide variety of food applications ranging from soup mixes to baked goods, from fruit fillings to puddings. These are added to their cassava flour used in extrusion applications. With the rise in the popularity of the gluten-free label, it has become increasingly attractive for manufacturers to seek starches from sources other than wheat. However, that shouldn't be the only reason to explore other starch venues. All starches are not created equal. Each source has its own individual properties and advantages, depending upon the application. And each, in its own way, is helping restore starch to its proper standing as a healthful food ingredient. The larger and more exotic the seasonings, the more snacks need starches for adhesion.